Remember back in January when I said I was throwing my reading goals out the window so I could read Among Others, a book I hadn't heard of until it released but immediately knew I had to read? Man oh man, am I glad I did. This, after all, is why I don't believe in strict to-be-read piles, lists, or limits. There are just too many books out there that I don't yet know about. How could I possibly limit myself to a list? 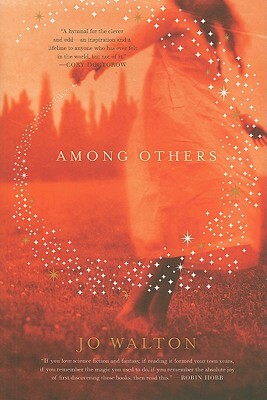 Among Others, despite its somewhat cliché cover design, is a an unusual and compelling of a young girl struggling to find her place in the world after the death of her twin and separation from her mother. Through her diary entries, we are entered into Morwenna Phelps' world: a world of twins and half-existence, fairies, estranged family member. Morwenna is different, but like any teenage girl, she is trying desperately to figure out where she belongs, what she will grow up to be, and who she is. Many of the themes here are familiar: a twin fighting for a sense of identity and independence; the child of divorced parents examining a past relationship; an orphan looking for a family; a schoolgirl looking for friends; a cripple seeking acceptance. But told all together in a world in which fairies influence events, magic can be seen and understood by those willing to look for it, and books provide a powerful force in shaping young adults' lives, Jo Walton's novel is nothing familiar. On reading the first pages, I was disappointed to find I had signed up for 250+ pages of journal entries. Again? We've done the teenage-girl-diary before; Anne Frank cornered that market. But Walton pulls it off, moving things along nicely enough but peppering entries with those standard high-school concerns: cheating, boys, grades, holidays, and status. Despite an occasionally slow pace, the insight we get into Mor's thinking is worth waiting around for. Her world revolves around the fairies, making sense of what happened to her sister, and the science fiction books she devours by the week. Don't you want to rediscover the wonder that is the library, a home for books to be shared? Bottom line: Mor's story starts out with the end; like Tolkien, her idol, she understands "the things that happen after the end" (p. 60), and her end is the death of her twin. But slowly, through new relationships, books, and yes, magic, Mor comes to understand that this is just an end, not the end. She matures, her reading matures, and her writing matures, culminating in a satisfying conclusion that still manages to leave much to the imagination. Among Others is a must-read for anyone who has ever been touched by the magic they read about in books, or ever felt that there is something more to this existence than meets the eye. This coming-of-age story takes a step back from the standard high school experience, deftly blending science fiction and the very real experiences of high school (friends, family, money, grades, and dating) in a book that is sure to carry you along in its currents. Not to mention the list of books merely mentioned will triple your reading list in the few short days it will take you to finish it. Many thanks to my husband for providing my copy of this book. I loved the way the magic worked as well. But yes, it was Mori and her intellectual and emotional development that made the book for me. I'm glad you enjoyed it as much as I did! I agree with everything you have said! :p I didn't love the diary format, though, honestly. It felt a little off -- especially when she was giving background on her family. Who spends all day writing about all their aunts? I think you were the one who made me so excited about downloading this book! Glad to see it has lived up to the expectation. It's on my Nook Color now and I can't wait to read it! I'm still a little dubious about this one. I've never been able to get into the journal style of writing. I do love the quote about the rose and the airplane, though, so I might have to reconsider. Andi - I was disappointed on first starting when I realized it was journal entries, but I didn't find it distracted from the story at all. Nymeth - The magic made it for me; not wizards and witches, but a magic that fits into the world we already know. Jenny - I guess you're right, the family background in diary format was a bit odd. But I thought the journal read more like a biography/confessional than straight journal-for-herself. It felt like she was speaking to someone, not just to record her own thoughts. In that light, I don't think the family explanations as odd. Coffee - Hope you enjoy it! Can't wait to hear your thoughts. SM - I am right there with you on the journal entries. See my responses to Andi and Jenny, though; I think the journal worked, here, as disappointed as I was to see it was journal format when I started. Oooh, this sounds good. Thanks for throwing your reading goals out the window! Emily - You are very welcome. I really, really enjoyed it.